If you were to go back into the archives of Modern Family reviews and strictly focus on the two seasons I’ve written about, I’m confident you’d find a lot of musing on Phil Dunphy. Hell, it was only a few weeks ago that I basically structured a whole review around the premise that Phil is the only character left on the show who feels real and is allowed moments of meaningful conflict and growth. Sure, there have been some necessary swipes at Manny and the occasional asking of “is Joe actually real or a figment of Jay’s imagination?” but more often than not, it’s Phil’s storylines that prove to be ripe for analysis. That, or I overly identify with an outgoing white man who’s also desperately insecure. Take your pick. The inventively titled “Basketball” once again proves that despite the best efforts of a loud Gloria and a gossipy Mitchell and Cam, it’s Phil that continues to offer up Modern Family‘s most rewarding moments. Part of me thinks that this is just the natural progression of any sitcom; once the uniqueness of each character has worn off, all that’s left is the real essence of who these people are, and Phil’s mix of vulnerability and childlike wonder provide the most fruitful opportunity for storylines that pack an emotional punch. Gloria’s realization that she loves her “pretty, pretty life” and that she doesn’t feel bad about her privilege just can’t compete, on an emotional level, with Phil’s consistent need to prove himself to others. That doesn’t mean “Basketball” is a complete dud outside of Phil’s storyline. In fact, nearly every other plot this week boasts some semblance of charm, even if nothing really comes together as a whole. The worst of the bunch sees Claire doing everything she can to hide a bad business deal from her father. She’s using Ben as her own personal, closet-business version of The Wolf, hoping to scrub away any evidence that she ever bought some tainted lumber. Jay though, having realized that Joe doesn’t fear him at all, comes to the office in the hopes of showing his son his Mean Boss side. Of course, that just leads to Jay discovering Claire’s bad deal. There’s a few nice moments tucked into the story—the climax in particular, with Claire swallowing a fish in order to keep the ruse up, earns a laugh—but ultimately they don’t amount to much. Every storyline involving the closet business boils down to a conflict in philosophy between Jay and Claire; it’s stale at this point. Cam and Mitchell fair a little better, mostly because their storyline plays to one of their biggest strengths: gossip. Here, Mitchell and Haley are on their yearly High Tea outing, but this time around, what with Haley being an adult an all, she has some serious business to talk. Namely, Rainer has asked her to do something in the bedroom that she’s not totally comfortable with. Just as she’s about to spill the beans to Mitchell, Rainer shows up like a dark cloud on a sunny day and prevents Mitchell from hearing the gossip he so desperately needs to hear. Eventually Cam shows up as well, and what follows is a fairly delightful bit of uncomfortable comedy. Typically I don’t respond all that well to characters being cold for no reason, but there’s something about Cam and Mitchell’s response to Haley’s secret—they’re more interested in learning Rainer’s kink than they are in protecting Haley—that works. It’s mostly in the way Eric Stonestreet and Jesse Ferguson play the scenes, with equal parts knowing confidence and a sense of sheer vulnerability. Mitchell’s curiosity about Rainer’s kink, which turns out to be “candleing” and so much more disgusting than anything else I was thinking in the moment, ends up backfiring on him, as Cam finds out that his husband has certain things he’s not willing to ask Cam to do. Essentially, the setup is all there but the follow through is underwhelming, with Rainer and Haley quickly making up and Cam discovering that Mitchell’s previously secret request is to have his back shaved. At least the storyline works as a series of escalating gross-out moments. Still, it’s back to Phil we go. Exactly one year ago Phil totally choked during a charity basketball game that pits the teachers against the parents of the students. Phil, because he’s Phil, is determined to not let that happen again. He’s been training day in and day out since that failed free throw, hoping for that moment to come again. That is until he shows up at the game and finds Charles Barkley and DeAndre Jordan in attendance. That makes him forget all of his training; now, he’s only focused on choking in front of two NBA stars who conveniently packed a picnic lunch for the game. Admittedly, there’s not a lot to this story. “Basketball” is so busy jumping around between plots while finding time for guest star Jane Krakowski to be hilarious that there’s hardly any time to check in with Phil’s attempts to change his fate in this year’s game. But, as is often the case with Modern Family, a late-episode moment hits home, making all the rather listless plotting beforehand seem worthwhile. In “Basketball,” that means Phil is once again thrust into the spotlight and given one free throw in order to win the game. This time though, the power goes out and the game is called. 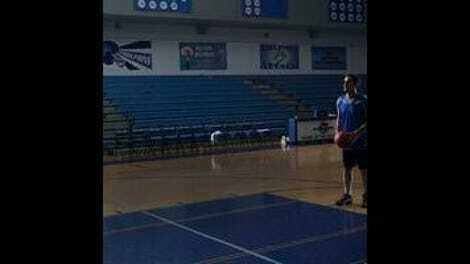 So, Phil goes back into the gym after everyone has left and takes that free throw. He sinks it, his year of hard work validated. It’s such a small, seemingly meaningless solitary moment, but Ty Burrell sells the hell out of it. I think he’s the key to Phil being such a relatable character. Those small moments don’t feel like contrived sitcom fare, but rather real signs of personal satisfaction, and that’s due in large part to the way Burrell fully embodies the character. We’re here for Phil, every step of the way, and even eight seasons in we can delight in his triumphs. Gloria has no time for the typical “blonde, airhead, Barbie doll, doctor” type. I still really don’t know how to feel about this Haley-Rainer relationship. It still feels like a bad joke more than anything.